In 12 words or less, starting with “what if” , charismatically describe your book so everyone will want to buy and and read it. Sounds simple enough. But here’s the funny bit-it’s not. What if you were the only person who could fix magic? It isn’t a bad sentence, but would it sell my book? It doesn’t really hit at the real story, does it? What if a human could save the universe from fairies? Hmm. I like that one better. Closer to what the book is about, but it vilifies the fay a bit too much. What if saving one life could magically alter the course of fate? Okay, well it isn’t perfect, but to be fair I have to keep it to twelve words, so it will do. What about you reader? Tell me what you came up with in the comments below. Happy Writing! The end of The Guardian, By Joan M. French-Warner, but not the end of the story. Life at the sanctuary is good now. I am amazed at how well I feel, which is evident in my shiny coat and clear eyes. Every day I get taken to the arena. 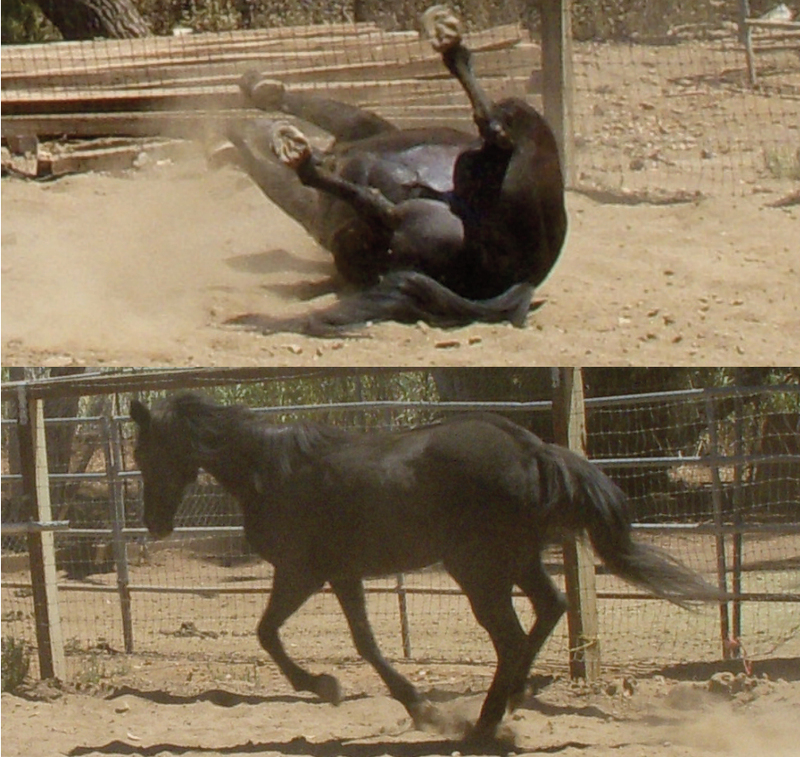 It feels so good to be able to kick up my heels and run like the horse I was meant to be. Slew, who stands a proud seventeen-and-a-half-hands, is feeling much better, too. He gets turned out in the arena for his morning exercise, and receives continual care for his feet and legs. He is a loveable guy who thrives on attention. You have an open invitation to come see us, talk to us and pet us. An abundance of love and appreciation will be yours in return. A once-beautiful dark brown thoroughbred staggered in to the auction pen and was purchased by the Kill-buyer. Then “rescued” by the same animal hoarder who rescued me. He told me that before being sent to auction, his stall mate had bullied him, keeping him from food and water. Rain rot, a bacterial infection caused by prolonged wetness, heat and humidity, covered his back and withers. 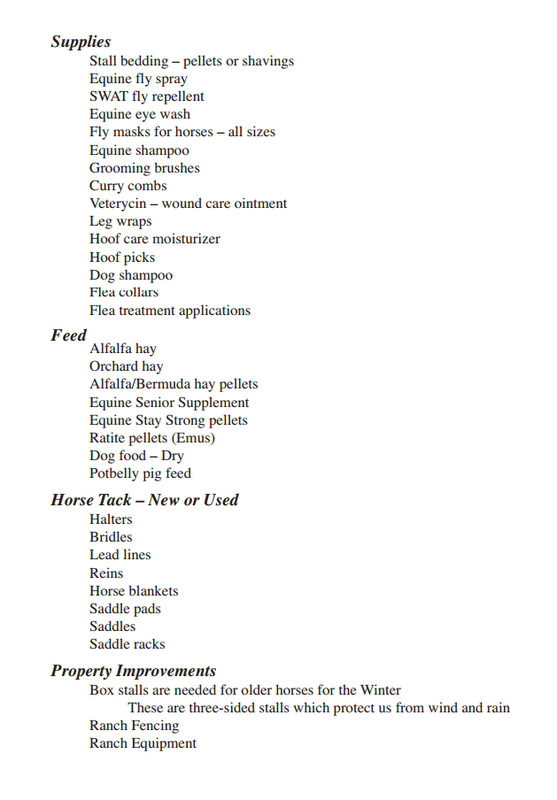 Severe laminitis and an abscessed hoof caused lameness and pain. He had not been treated by a vet in years. He was only fifteen years old. You could see no resemblance to the proud racehorse he had been. He is the great-grandson of Seattle Slew, an American Thoroughbred who won the Triple Crown in 1977. Perhaps his racing name, “Nearly Lucky,” jinxed him. Slew had not inherited his grandfather’s racing genes. One cannot compare Slew’s career winnings of $7,300 to Seattle Slew’s total purse—$1.2 million. A non-winning horse is obviously a liability in the racing community. His owners sold him and his fate deteriorated from there. Slew is my stall neighbor and we watch out for each other. When I get taken to the round pen for exercise, he calls to me the entire time I’m there. He’s so happy to see me when I’m returned to my stall. Three emaciated horses stared from lifeless eyes into TV cameras. 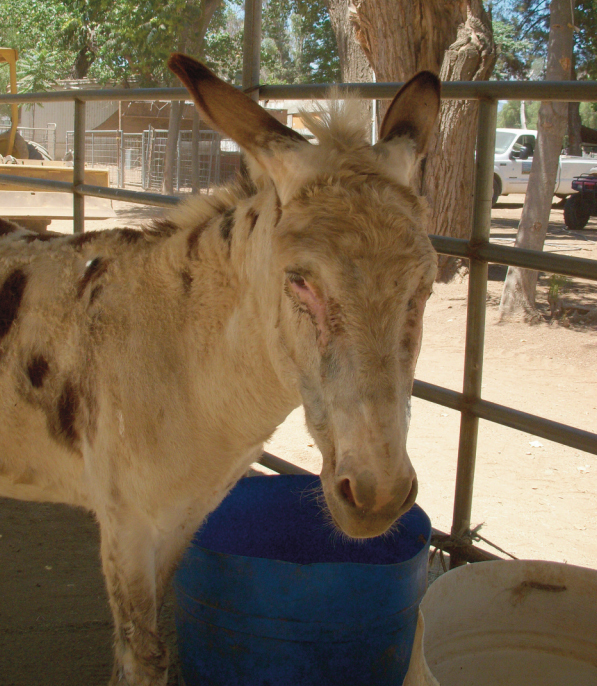 A plea for donations to help seventy-five of us regain our health shattered the hearts of animal lovers. 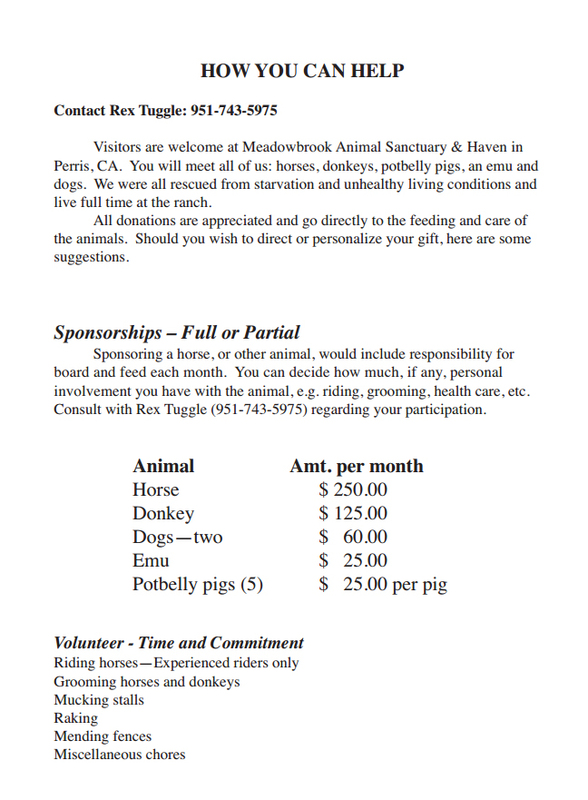 A few years later, when it became apparent that we did not benefit from the contributions, the Board of Directors gained control of the sanctuary and hired new staff to care for us and maintain the property. Now, a year later, we are all healthier. Several of us have been adopted by loving humans who have promised forever homes. We who remain are visited regularly by the vet who monitors our health. The farrier also makes routine visits to take care of our feet. A few of us were moved into our own single pens with partial cover from the hot sun. Some of us remain in small herds in large pens. The pens are cleaned daily. We can’t forget our other friends here. Two dogs remain of the thirty that were dying from mange and other diseases. 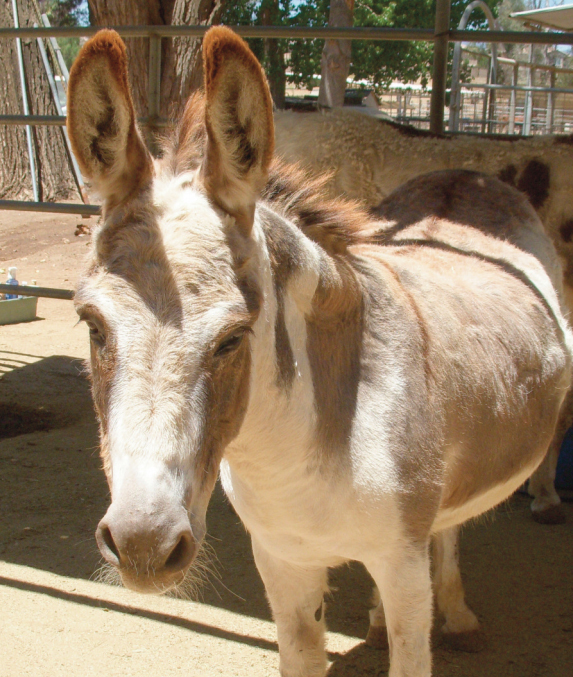 Roberto and Burrito, two of five donkeys, were close to dying. Their big bellies are telltale signs of having been given alfalfa to eat. They thrive on orchard grass for good nutrition. Acute summer sores infected their legs and faces and erased the hair in those areas. They continue to receive daily treatments of medication and care. Although they have recovered, they will carry scars for the rest of their lives.